Constantly slamming cabinet doors can limit your enjoyment of time spent in the heart of your home. Stop the slam and take back your kitchen with Liberty's Soft-Close Cabinet Hinges. Designed for a 1-1/4 inch overlay, these hinges are retrofit able and allow any level DIYer to do away with the heavy slamming of cabinet doors. The larger overlay leaves your cabinets with a more contemporary high-end look. 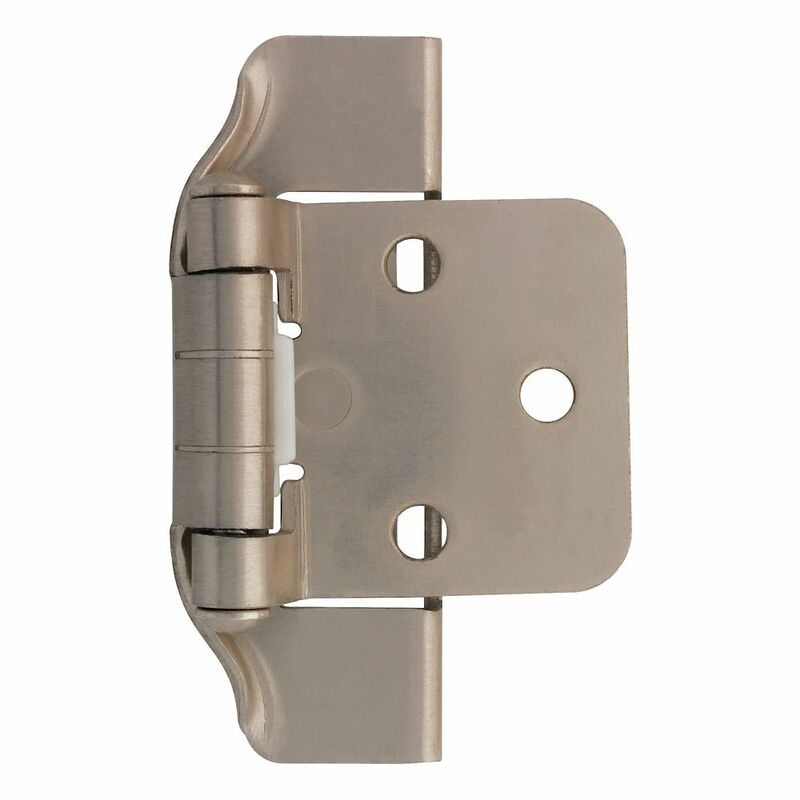 1/2 inch Semi-Wrap Overlay Hinge The Liberty Satin Nickel Semiwrap Overlay Hinge is made from sturdy steel material and requires little to no force for cabinet door closure. This full overlay hinge conveniently has a self-closing feature for your cabinet and vanity mounting projects. Made from steel with a brushed nickel finish. 1/2 inch Semi-Wrap Overlay Hinge is rated 3.9 out of 5 by 35. Rated 5 out of 5 by HomeDepotCustomer from Just what we need to replace old hinges. Our... Just what we need to replace old hinges. Our handyman installed them. They work well and are an improvement over the old ones. Rated 3 out of 5 by Cadman from I bought two batches of these hinges on two separate... I bought two batches of these hinges on two separate occasions. It was apparent on the second batch that HD was using a different supplier (as evidenced by different packaging with same product number). The screws in the second batch had some rust on them and they had common zinc plating instead of the Satin Nickel finish as the previous batch had. I understand trying to keep cost down, but not at the expense of quality. Rated 5 out of 5 by Cindy from These were easy to install, nothing was missing from the... These were easy to install, nothing was missing from the packages.